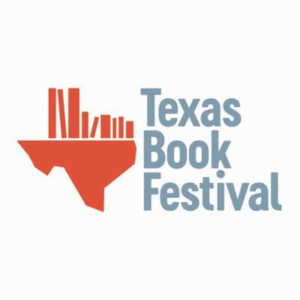 Tracking Texas Water at the Texas Book Festival: Hugh Fitzsimons and Seamus McGraw will speak on the panel "Tracking Texas Water" Oct 28 2018. 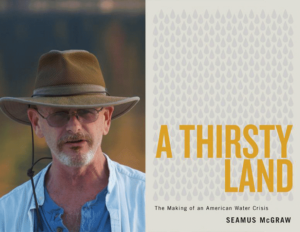 On Thu, Oct 18th, Seamus Mcgraw will present, “A Thirsty Land: The Making of an American Water Crisis” at DelVal University. Join Texas Observer editor Forrest Wilder, rural reporter Christopher Collins, environmental reporter Naveena Sadasivam and McGraw for a series of conversations about Texas’ convoluted and outdated water policy. 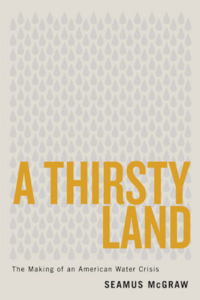 Join us at for a Discussion, Signing at Island Bound Bookstore of A Thirsty Land: The Making of An American Water Crisis by enviro jourmp and author Seamus McGraw .As a changing climate threatens the whole country with deeper droughts and more furious floods that put ever more people and property at risk. Winston-Salem is a place that boasts great natural beauty and is a perfect setting for a discussion signing by enviro journo Seamus McGraw who traversed the state of Texas on his motorcycle as research for A Thirsty Land: The Making of an American Water Crisis, published by University of Texas Press. Join us at for a Discussion, Signing at Page McIntyre's Books of A Thirsty Land: The Making of An American Water Crisis, on June 3 at 2 p.m. As a changing climate threatens the whole country with deeper droughts and more furious floods that put ever more people and property at risk, Texas has become has become a bellwether state for water debates. Will there be enough water for everyone? Is there the will to take the steps necessary to defend ourselves against the sea? Is it in the nature of Americans to adapt to nature in flux? Flyleaf Books, 752 M.L.K. Jr Blvd. Flyleaf Books Chapel Hill is a small town in a big area, named one of America's Foodiest Small Towns, Bon Appétit, home to a thriving music scene, and to UNC - a natural fit for discussion signing Flyleaf Books by enviro journo Seamus McGraw who traversed Texas on his motorcycle for A Thirsty Land. McGraw traveled the length and breadth of the Lone Star State talking with people whose livelihoods are directly contingent on the flow of water, a problem that will soon confront Americans everywhere given the trends of climate change. In that sense, as so often, Texas is a bellwether. Headhouse Books, 619 2nd St. The Vermont Book Shop, 1473, 38 Main St. Testing the Waters in Texas-- "Whoever figures out how to save Texas might just save the rest of us in the process."